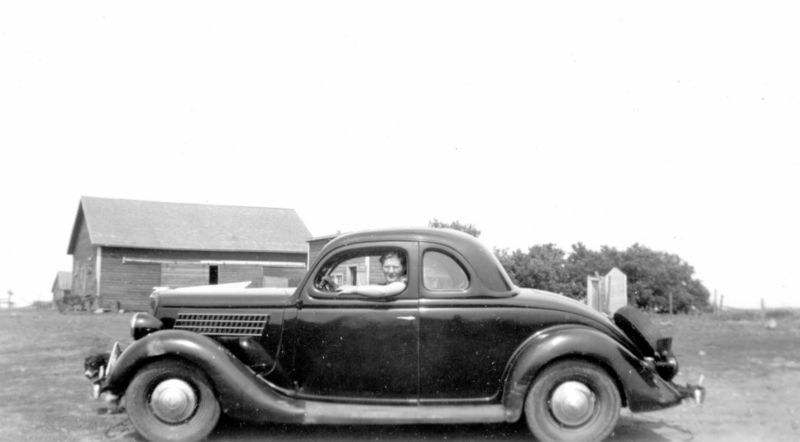 5-window Ford Coupe, 1935 or 1936, with an odd hood ornament: it looks more like a Buick ornament than other Fords of the time, or it could be aftermarket. There also appears to be an interesting ‘fin’ running down the center of the hood, but that could be something in the background. 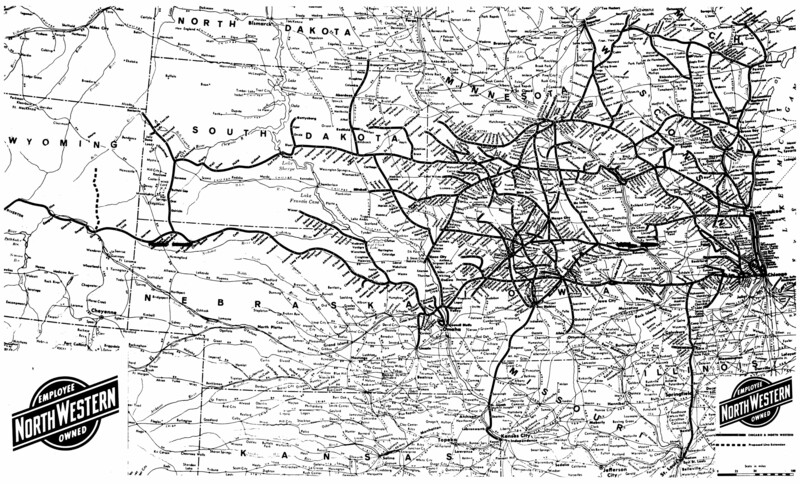 Taken in the mid-1930s. 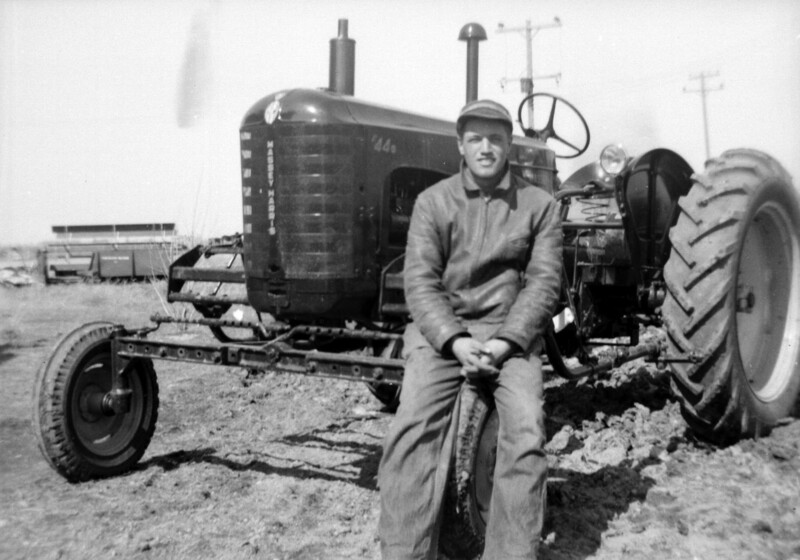 A farmer, dressed for cold weather, standing next to a Massey-Harris ‘44. 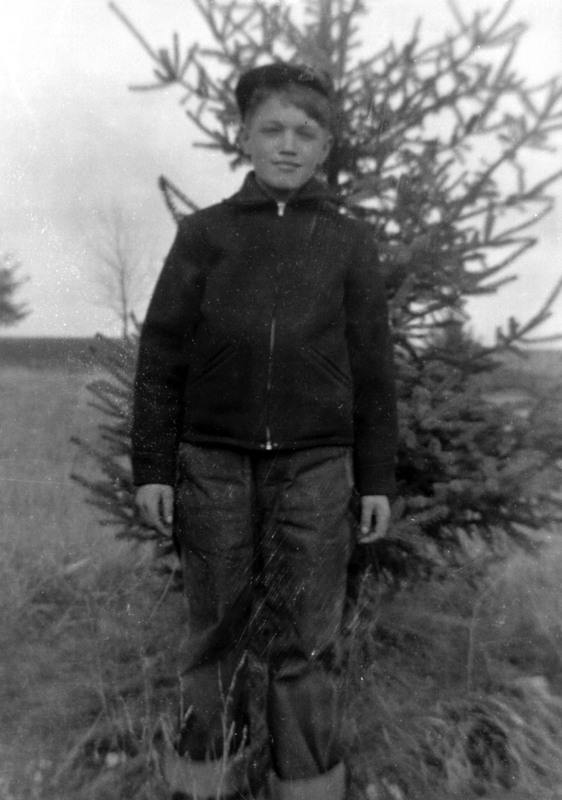 This photo appears to be the partner to this photo – the camera was traded, giving us a rare look at the photographer of most of these photos. The advertisement is selling crop spraying equipment, and it’s quite a small ad, so there’s no time for them to explain the references. 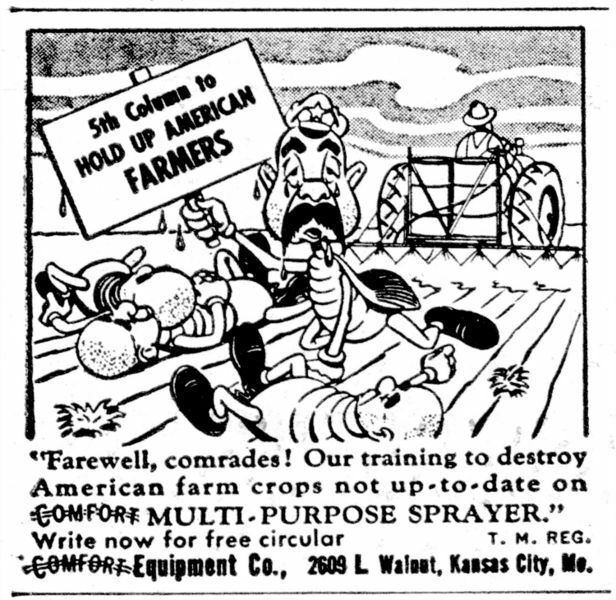 First, a critter, wearing a military cap adorned with a star, is holding up a sign that reads, “The 5th Column to Hold Up American Farmers.” The ad’s copy reads, “Farewell, Comrades! Our training to destroy American farm crops not up-to-date on Comfort Multi-Purpose Sprayer.”. A “Fifth Column” is an organized group of moles or dissenters, thwarting war efforts from within a country. However, the style of dress of the head ‘critter’, and the broken english used for his speech would indicate that the critter is intended to be an invader from the Soviet Union. So, who are these invading armies? My best guess is the Russian aphid, a common wheat and barley pest in the midwest. Today, selling insecticide by Photoshopping a suicide-bomber vest and turban onto an anthropomorphic insect wouldn’t go over so well; times were much different back when enemies were clear and well-defined. Boy standing next to a small pine tree, 1920s. 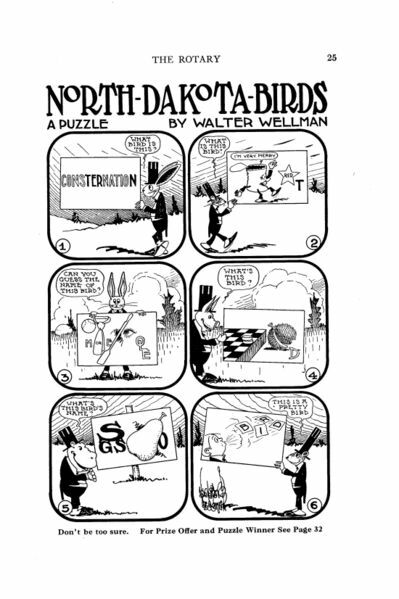 Try your hand at these: rebuses depicting native North Dakota songbirds, circa 1917 (click for larger view). The illustration is by Walter Wellman, a popular illustrator of the time, known for doing naughty postcards as well. From Uncle Will’s Magazine for Children, “The Rotary”, February 1917. 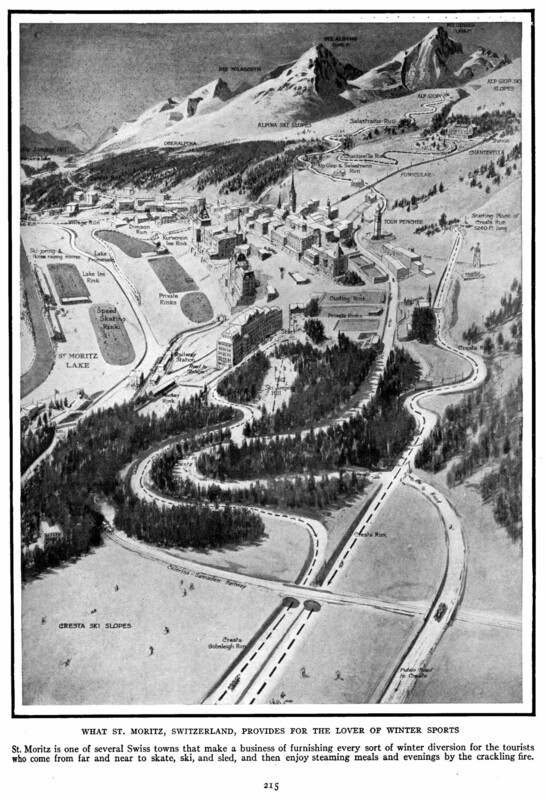 St Moritz remains a “cradle of winter tourism,” as it was nearly a century ago. 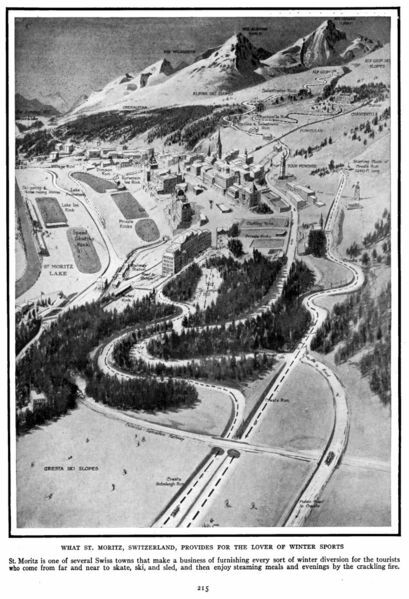 According to the caption, St Moritz “is one of several swiss towns that make a business of furnishing every sort of winter diversion for the tourists who come from far and near to skate, ski, sled, and then enjoy steaming meals and evenings by the crackling fire.” From the encyclopedia “Our Wonderful World”. You are currently browsing the The Infomercantile blog archives for January, 2009.